A while back I built a simple constant current electronic load using an aluminum HDD cooler case as the heatsink. While it was sufficient for a few amps’ load under low voltages, it could not handle load much higher than a few dozen watts at least not for a prolonged period of time. So this time around, I decided to build a much beefier electronic load so it could be used in more demanding situations. One of the features a lot of commercial electronic loads has in common is the ability to sink constant power. Constant power would come in handy when measuring battery capacities (Wh) or testing power supplies for instance. To accommodate this, I decided to use an Arduino (ATmega328p) microcontroller. The schematic below shows this electronic load design. To make the schematic less cluttered, I had deliberately omitted the filtering capacitors and decoupling capacitors. I also omitted the microcontroller circuitry as it is rather standard. All the connections to the standard Arduino board are clearly marked for easy references. The Arduino source code can be downloaded towards the end. 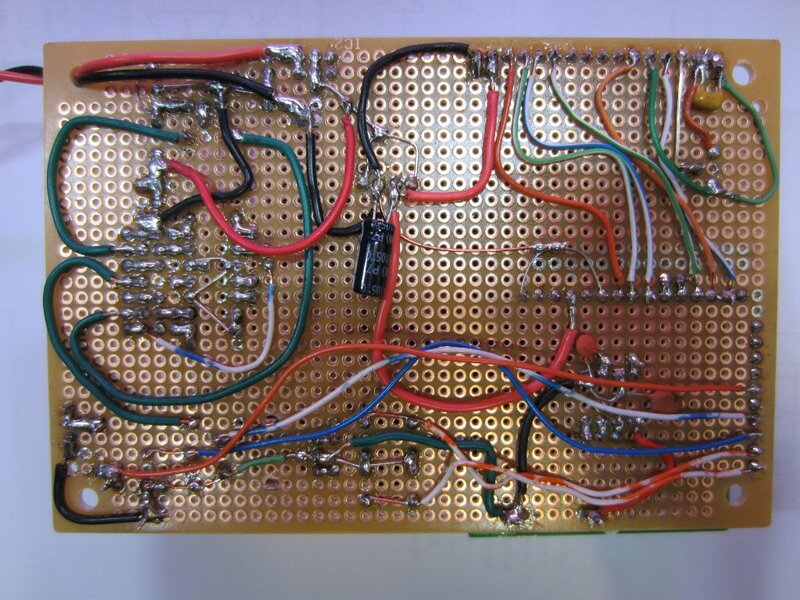 At a first glance, the circuit here seems a lot more complicated than the simple one I built before. But the core power stage portion is actually quite similar. I used 6 IRFP150N‘s to handle the load. These 6 MOSFETs’ are divided into three groups: each group consists of two MOSFETs paralleled together with independent gate driving resistors. The three pairs are then driven independently via three Op Amps. 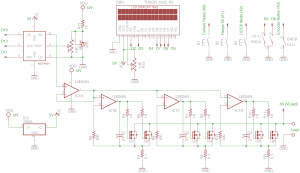 This design ensures equal distribution of the load current among these three groups of MOSFETs. With this configuration, the maximum power this electronic load can dissipate is at least 200 Watts for a conservative estimate. In the circuit above, IC1A forms a voltage follower, which buffers the DAC output and the inputs of the three driving Op Amps. 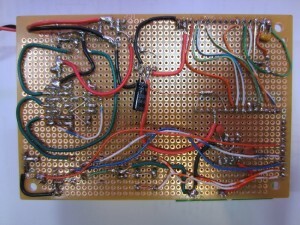 An LM324 is used here for the four Op Amps. Of course, the choice of the OpAmps here is not critical and you can substitute with pretty much any general purpose ones. The DAC I used is Mcirochip’s MCP4921. MCP4921 is similar to MCP4821 which I used before. The main difference is that MCP4921 uses an external references whereas MCP4821 has a built-in 2.048V reference. This is also the main reason I chose MCP4921. By varying the external reference voltage, we can strike a balance between the maximum current allowed by the electronic load and the current adjustment resolution. In my design, the reference voltage to the DAC is provided via a resistor divider from the voltage reference IC TL431. The DAC’s external reference is configured as buffered input for high impedance so that the DAC reference input does not affect the accuracy of the reference voltage set by the resistor divider. When the external reference is set at 0.5V, the load current can be adjusted up to 15A (0.5 V / 0.1 Ohm * 3). MCP4921’s output voltage can be adjusted to upwards to either 1 x Vref or 2 x Vref, so the current range can be doubled via a software command without the need to change the reference voltage. If you do not need such a high current range, you can lower the reference voltage, it will give you a better current resolution (Vref / 4096 per adjustment step). An encoder is used for current adjustment. By default, the current can be adjusted at a resolution of approximately 1mA/step. By pressing the encoder button, this resolution can be changed to 10mA/step and 100mA/step respectively. This makes it easier to to coarse adjustments. Constant power mode is achieved by calculating the desired set current via the measured load voltage. 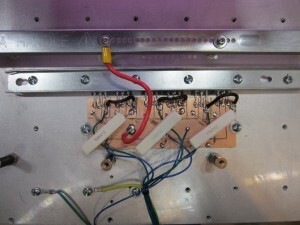 Here are some pictures showing the construction of this electronic load. The heatsink I used is a huge piece of aluminum block I got at a local auction. The original owner builds audio equipment and he used these heatsinks for his class A amplifiers. Anyway, the size of the heatsink is probably an overkill, but it certainly works nicely even without forced air cooling. 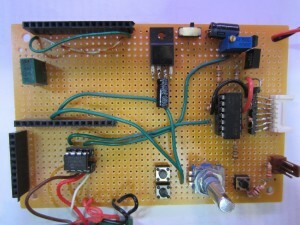 The entire control circuit is built on a protoboard. I used the Arduino board I made earlier and used headers to mate it onto the main board. This picture shows the electronic load operating in constant power mode, absorbing more than 200W of power at more than 60 Volts. Because we are using a microcontroller here, we can add other features easily. While I did not include in my firmware code, you could easily add in a constant resistance mode for example. Or you could enable the data logging capability by writing out the current and voltage at a present interval. First of all a huge thanks for publishing this design. I have already purchased the major power components to build my own. I am also trying to spin up a PCB and have it fabbed up in one of the online board houses. While waiting for all the components to arrive I have had a play with your code on an UNO with the ADC, encoder and reference connected. 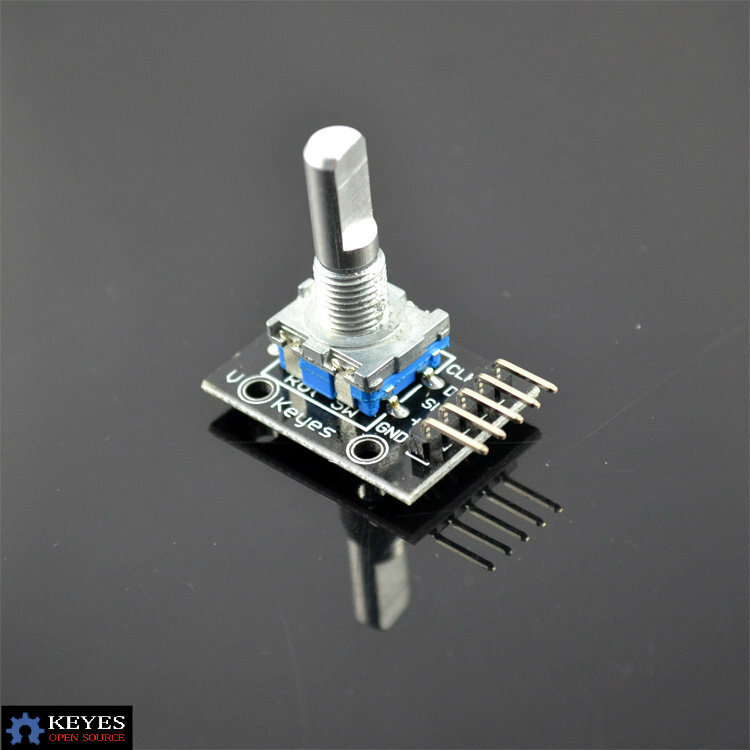 The problem I have is the rotary encoder seems to be totally ignored. The encoder I have is this one http://image.dhgate.com/desc_398209987_00.jpg The pins are labeled +v, gnd, SW,CLK and Data At first I thought the switch was faulty or incompatible but it seem to work OK with the basic test sketch provided in the library (Teensy PJRC) I tried removing the encoder from the PCB to use it ‘naked’ also with a Arduino Mega to with no improvement. I would greatly appreciate some help getting this to work. These encoders typically have 5 pins. I am not sure how the board is routed, but the one side with three pins are the side for the encoder, with right pin being common and first two pins for the gray code output. The other side with the two pins is the switch. Could you trace those pins and see if the connection is correct? I would be interested to see If you have any luck using the latest Arduino software. Thank you again for the time and effort in creating and sharing these projects. Thanks for letting me know! I will have to take a look using the latest version of Arduino. Any joy using a more recent arduino releases ?. Like ROB B i could not “get it going” until i reinstalled arduino 1.0.5. Very interesting article/build, thanks for publishing it. You mention that you have omitted some capacitors from the schematic, is it only the standard supply decoupling caps on the opamp/DAC/78L05 and the LCD that are missing or is there something else? Otherwise is it as simple as hooking up the Arduino and loading the code? Yes, the omitted ones are just some decoupling caps. And the code attached is the actual code I am using for this project. Manage to make quite a lot of progress on the PCB today. I reduced the number of output FETs from 3 pairs to 2 pairs (beaches I am limited to the free version of Eagle) and made some other changes that I thought made sense. Still work in progress, but I think it is looking good. The board measures 3.95″ x 2.8″. What is the maximum input voltage for the electronic load ? Current and voltage are limited by MOS or software (or both) ? The input voltage is limited mainly by the MOSFET. Since I used ATMega328p’s analog input pin to sense the load voltage, you will want to adjust the voltage divider (and the software constant) if you want the load voltage to be higher as the input can’t go above 5V. I programmed an Atmega328p with compiled code (Arduino 1.05 with added Encoder Library works OK). I assembled the project in a Solderless Board for the test (I am still waiting for the DAC chip to come). 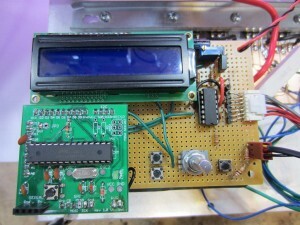 MCU (Atmega328p) with All 3 Switches and the Encoder along with the LCD works OK. I have a few points to get clarified before going ahead as I am using an Atmega328p stand alone instead of an Arduino Module. 1:Connecting A5 (Pin 28 of the MCU) to GND Load Voltage comes to 0 but when connecting it to VCC (Pin can’t go above VCC) the voltage goes to 117.3V obviously a voltage divider is needed , A5 (V Load) in the schematic appears to go directly to A5 input,What should be the Voltage divider ratio ?. 2;LCD (1602 LCD Module) pin 5 (RW) is not connected in the schematic but it had to be connected to GND. Well.. the divider ratio is up to you as long as the ratio you use is relfected in code. So if your maximum load voltage is 100V you will need a 19:1 ratio divider so the input to the analog pin does not exceed 5V. It works and the voltages given appear correct. To complete the project I have to wait until the DAC arrives from ebay(Another 2-3 weeks). I am using a 16MHZ crystal is it correct ?. Yes 16MHz is the standard Uno clock frequency. I am using a 16 MHz Nano for my build. I also used an I2C 20×4 LCD. This frees up a bunch of IO’s that can be used for other functions and display ‘soft’ key legends on the LCD. In testing I have found an old school AMD CPU cooler and fan is ideal for two mosfets and up to 250W dissipation. So with 3 coolers 600W disipation should be achievable. The current crop of Intel coolers are too small to mount two mosfets and are likely to be less effective at heat dissipation since modern CPU’s are more energy efficient. IRFP640 mosfets might be the optimal mosfet to choose with a quoted 300W max dissipation each althogh I have not tested them. That means you are using a serial LCD module that can be connected with just 4 wires instead of 10 wires needed for a parallel LCD.16×2 LCD shows 2 display lines.Does 20×4 LCD show any other information ? and if so how did you connect the module ?. With regard to the MOSFETs I prefer those with TO-247 or TO-3p case instead of TO-220 as I have experienced frequent failures of TO-220 MOSFETs under high power even when used within the ratings whereas TO-247 and TO-3P are very reliable (May be the surface area). In addition I expect to see how IGBTs behave here those may not be suitable due to high saturation voltage and the reading may become inaccurate at lower voltages (AS the current is not sensed through a load resistor). I have a large enough heat sink for the project. I hope the DAC will arrive soon for me to complete and run a test. I am looking forward to see if someone add a Constant Resistance mode as well. We are considering using your circuit but beefing it up to be able to handle loads up to 500VDC @3.5A. Our guys seem to think that if we choose higher voltage MOSFETS, caps, etc. and add some isolation to protect the higher voltage that this might work. I was wondering if you would have any thoughts, comments, or suggestions about doing this. If we do this successfully, we will spin PCBs, do a sheet metal chassis/enclosure, and make this almost like the old Heath Kits from years ago. And of course we will share the final design(s) for others to utilize. 500V @3.5A that’s 1750W maximum power dissipation! 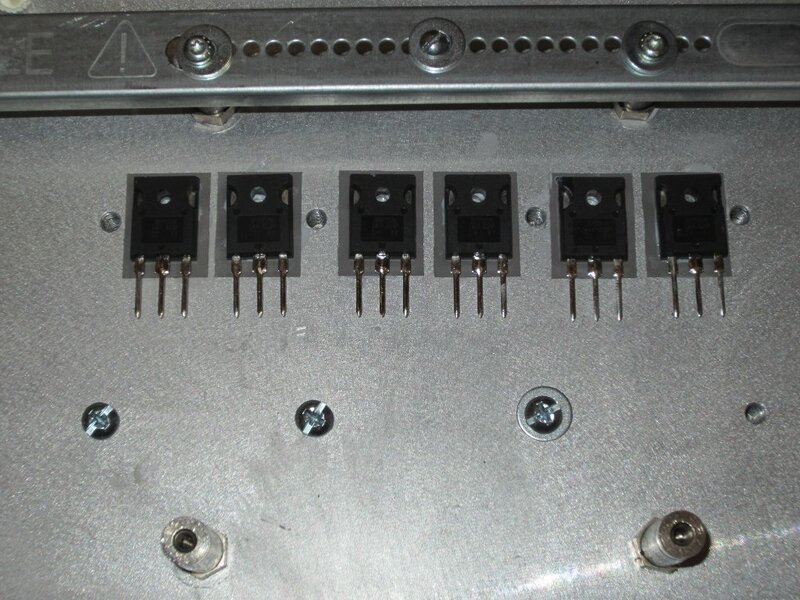 In principal similar designs with lots of high voltage MOSFETs carefully balanced in parallel should work, but I think you will need a much more robust design. For instance, if a MOSFET fails (e.g. DS shorted) it would short your 500V voltage rail which could cause some serious damage due to all the energy dumped in at once. And without proper isolation, this could be quite dangerous as well. I am having a problem with the Reset switch S1 in CC mode, It brings the display to 0 but the load current stays as such and it needs to rotate the encoder at least one step in either direction to stop the load current, I found that connecting a Diode from A0 to D5 (Cathode to Anode) fixes the issue. I can’t find any fault in the circuit either. The CP mode works perfectly. Hello, I am sorry To bother you but yes i am making this too! I was wondering instead of the irfp150n if i could use a cheaper IRF540n. Correct. -40 V comes from the negative side as you can see from the last picture. The current and voltage controls do not use pot, they are rotary encoders. The pot is for adjusting the contrast of the LCD. You sure can. Those were just the MOSFETs I had on hand. As long as the MOSFETs are adequately rated, you should be fine. These linear loads can use pretty much any MOSFETs. Correct. Those two are the encoders for controlling voltage and current settings. Thank you for all your time :) That should be all my questions for now! Well i mean until the parts come in! But would you advise against Designing an etching my own board due to the high current? or do you think it would be okay using thick traces? Thicker and wider traces are definitely beneficial, you can always solder on additional copper wires (or just tin the traces) to increase current capacity if needed. Got my prototype boards nearly ready, but I need to do the mechanical stuff and tweak the software for use with an I2C-display before I am ready to test. Why is R6 so small 500ohm why not 10K? Thanks for this; I think it will come in really handy! I have a question regarding the R1, R2, R3 resistors. In the schematic, it lists it as 0.1 Ohms. But when I open the picture of the circuit on the heatsink, the actual cement resistor seems to be 1 Ohm. Those are 0.1 Ohm power resistors, even though their markings are 10WR1J. Thanks! Just one more thing: if I wanted to control the load via the Arduino to, say, turn on and off every 1 min, what do you think would be the easiest way of accomplishing this? To turn off the load, you simply need to set the gate voltage to 0. So what you could do is use a timer and whenever the timer is triggered you can set the gate voltage (controlled by the DAC) to the desired level. Hi, I’ve a quick question. After building the circuit (great design BTW) I found, that there is a minimum “idle” current of 0.7A. DAC seems to work ok as it goes to 0V, but I can’t get any lower current than 0.7A. Any help on this? 0.7A seems to be quite high. As some had pointed out, since LM324 is not rail-to-rail, the buffer (IC1A) might be outputting a voltage when the input voltage is zero. To test this out, connect the output from the DAC directly to the output of IC1A (pin 1) and thus by-passing it. If this solves your problem, you can either operate without the buffer or use a rail-to-rail buffer in its place. Thanks for so fast reply. I’m tracing the problem right now – I found that I’m getting 0.0012V directly from DAC (0mA settings) at pin 3 of LM324 and it rises up to 0.020V on pin 1 of LM324. This is the reason of such high idle current. Tomorrow I’ll try to remove the IC1A and connect output of DAC directly to the other three op amps. Hopefully it will solve the problem. If not, I may replace the IC with other LM324. I’ll let you know either way. Thanks again! otherwise your dispaly shows 0mA, but the current is still the same. Someone mentioned that before, but he used diode to simulate encoder movement that invokes changing DAC settings. Check yourself. Glad it worked! Thanks for the info. Why did you use an external voltage ref ic instead of trimming the output of the DAC in software? You could, but the internal ref in ATMega328 is noisy compared to an external ref. Hello, big thanks for your desing. I inspired and build constant power discharging device with mail reporting via Blynk. I dont see how your measuring the current or voltage of your load, was that portion left out? The current was just measured using a multimeter in current mode in series with the load and the voltage was measured across the load. 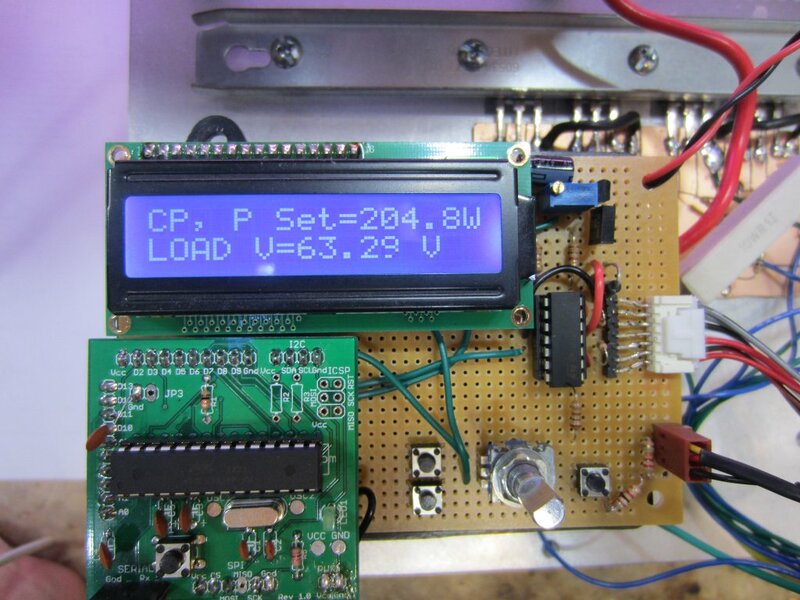 So your not measuring current or voltage with your controller? Sorry, I thought you were asking about the meter in the video. The voltage is measured by the MCU via A5 (see schematics) using a voltage divider. The current is not measured but rather calculated theoretically and set via the DAC (the meter was used to verify the current setting). Hope it helps! Very nice circuit. Simple and to the point. I have made some observations and would like your thoughts on them. 4) by measuring the supply voltage to the drain of the IRFP150, total power may be calculated to keep from destroying the MOSFETs. 5) Yes, you now need that big honking heatsink. May consider adding a fan after the heat calculations. 6) with circuit modifications 1.65 volts on the control give 8.1 amps of sinking power. 7) Give me an Email and I will send you the LTspice simulations. You can send me the LTspice simulations ? Another thought is to used a tool call PCB artist from from Advanced Circuits. Plus the development tools are FREE! schematic & layout. It will be desirable that the function of low voltage cut-off is included in this electronic load. The function is necessary in testing battery pack. 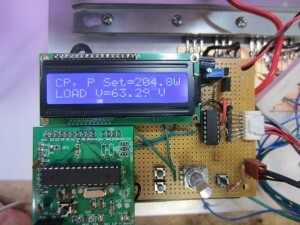 Build a DC Load myself and has been produced using EasyEDA processing. I have noticed one thing wrong with my design. As I approach 20V (or above) @ 5A, my power supply (DUT) current drops down to 4.99 and lowest 4.98. Once you go below 20V @ 5A it returns to normal and is stable. I would have to guess that where Im using a ground plane for all grounds, im experiencing a voltage drop. Could this be the cause? 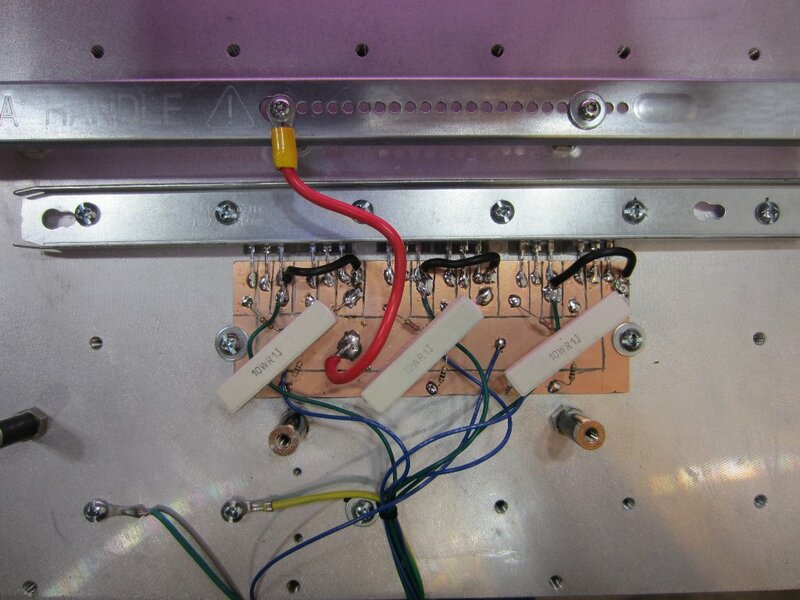 I am using a precision 10V source (MAXIM RFEF01C), LM358N, 2x IXYS ixfh36n60p (YES overkill ) and a 0.5 ohm 50W resistor. It might be due to the positive tempco of the 0.5 Ohm resistor if I have to guess. You can try this theory out by heating up the resistor using a hot air gun and see if the current drops. You’ve made a very helpful DC load circuit and thank you for bringing this design to everyone. I’ planning to buid a 3s battery discharger test bench with a discharge current up to 50-60A but i’m stuck with 0.1ohm resistors. Would you please help me out, how can i calculate the values of these resistors in respect to the rated power (let’s say i will have 10 watts for each resistor). Today, i started some calculation but i found that each stage of your design can handle up to 10A (30A in total with 3 stages) is that right ? Another thing, is there any simple current measure circuit that can handle up to 60A ? come on guys, is there anyone out there who can help me with this please ? First thank you for posting your work. Circuit looks ok to me. Did you use a resistive load? The circuit might be oscillating. You can check that by measuring the waveform from each current sensing resistor. Thank for your reply. Sorry, what does “resistive load” mean ? I think my circuit act doesn’t look like oscillating. When voltage continue increase up to 60,…70V circuit continue sink current up to 1, … 4A and burn 5A protect fuse. I meant a load resistor. Another possibility is the tempco of your current sensing resistor and when you pass a high current through them they heat up and their resistance change (which translates to change in current as the voltage across the sense resistor is pegged to the voltage reference via the opamp). Oh, that maybe my missing. I’m using 0.1 Ohm-5%-5W-Ceramic resistor to sensing current. I’m going to replace it by a ohmic shunt resistor or once like your and report as soon as possible. Thank you, kwong. I’ve using 10mR ohmic shunt but doesn’t solve issues. Very strange indeed, as the overall current is guaranteed by the feedback loop. Circuit work nice when V_DS < 60V. I've try 8xLM358 with 8xIRFP250N but circuit still over sink current. I'm using +12V and -5V as power supply for OP-AMP because I need invert negative voltage to measuring. Does it is problem ? Why do you think that I’m getting 117 volts on the LCD ? I’m loading the circuit with a 4 V @ 1A. Hey, as I know LCD 16×2 work at 4.7V – 5.3V. Thanks for sharing this design. I’m new to Arduino, I’m wondering how you connect this circuit to the Arduino. What connector do I need to mate with the appropriate connector on the processor card? about electronic load can you send me your code? If you scroll towards the end you will find the code attached. Many thanks for your design. I have just built it and the analogue side works fine but I am having trouble with the display – unreadable, all segments “lit”. Have tried 3 different displays and another Uno, all to no avail. (have connected R/W to GND. Any thoughts on what I may have done wrong? Did you adjust contrast? Some LCDs are more sensitive to contrast settings than others. Yes I have tried that, thank you. Have checked out the Unos and the displays in other ccts and they worked fine. Wiring checked, checked and double checked, even downloaded the sketch more than once and unzipped with different programs (getting desperate). Maybe I should stick to things I know about and forget about this micro controller stuff. Many thanks anyway. And I have the same problem. I have a doubt about a sketch, what purpose of below constanta ? In fact Arduino uno digital pins is up to 13pins. Those higher than 13 are the analog pins. If higher than 13 pins consider as analog pins, it is already used as 0,1,2, and 3. Then 14,15,16 and 17 is related to which pins in Arduino UNO ? I have not used the Arduino before. I am also confused about this section of the code. Where are pins 14,15,16,17 in the schematic? Those pins correspond to A0, A1, A2 and A3. By default those are analog pins but can also be used as digital pins. Hey Crazoff, I hope you are doing well, I am having a problem with display on mine as well, I have 1.6.8 and when I download and try to install the 1.0.5 it says I have a newer version, and my work would be lost. did you have an older version and upgraded to 1.0.5, or did you down grade? I have it hooked up like the schematic, hello world works with the pin settings from the load, thing is driving me nuts. hello very nice project.But i have a question. I do not want to use a very large heat sink.Can i add more units(every unit consist of 2 mosfet irf150,0.1 ohm 10w resistor,500 ohm,2x 1k resistors,1 nf capacitor and an op-amp of lm324n).Do i need to change the value of any other components;200w total power is enough for me,but i do not want to put a large heat sink,i think to split the power to 6 units(12 mosfet total).You have 3 units in your circuit. In theory yes. The main challenge of using more than a couple of MOSFETs would be to drive them. If you are using a single DAC to drive these MOSFETs (assuming each MOSFET has its own current sensing resistor and an OpAmp) then you essentially lowered the resolution of the DAC (if you are using 2 then you reduce the resolution by 1 bit if you are using 4 then the resolution is reduced by 2 bits and so forth). To resolve this issue you either have to have a very high resolution DAC or have to resort to multiple DACs. In my most recent posts I constructed a couple of high power dissipation electronic loads and I used a voltage standard to drive them. This looks like a good project. That’s really a wild heatsink that you found. Are they still available? What’s the actual size of it? Can you post a better picture of it, showing a bit more detail in its construction? Any idea as to its thermal resistance? 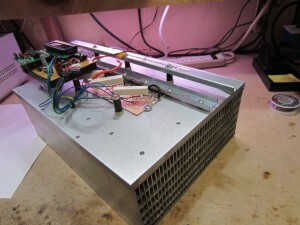 The heatsink measures 9.5’x12.5’x4.5′ and one side is half an inch thick aluminum plate. I grab these on a yard sale and the owner originally planned to use these for class AB amplifiers but found more attractive looking ones. I have not seen these for sale on eBay and probably because they would be expensive to ship. Each heatsink weights close to 10 pounds. I went to the Huntsville (AL) hamfest last weekend, and Lo & Behold, I found an enormous heatsink almost identical to the one you have. It’s a bit smaller in size, but identical in construction. It’s large enough that MOSFETs can be mounted on both surfaces for more even heat distribution. Likely built by the same manufacturer. Now I can get on with collecting parts for the project. Thanks for the info, Kerry. From what I can see of it in the pictures on your website, it has to be an extruded piece; almost certainly was a special-made piece for a unique application. Bet its thermal resistance would be extremely low, given its huge mass. Thanks for posting the project. I’m really thinking about building one for my own use. thank you for publishing this and the other experiments with linear mosfets. As these are expensive, I would build this DC load first. I was wondering: how each pair would distribute the load among each transistor in the pair? As they have more Id for more temperature at a given Vgs… doesn’t one of them take over the full load? The load distribution is not ideal using this setup and if you are experimenting with more expensive MOSFETs or higher power rating electronic load I would recommend using individual opamp to drive each MOSFET instead of simply parallel them together. That said, in my experiment I believe the power dissipation between the two differs by a maximum of 20%, but again it totally depends on the batch of MOSFETs you are using. The inverting input is tied to the current sense resistor so it should not be a problem if the circuit functions correctly. What opamp are you using? What’s the supply voltage to the opamp? You could parallel two diodes back to back and place them between the inverting and noninverting inputs of the opamp so the voltage input would be clamped should something go wrong. I am using I am using TLC272CP. Fine i will use a back to back diode at the input – should be normal or schottky diode ? Normal diodes should be fine. I am very puzzled by what you described. Assuming that you are using a separate power supply for the electronic load, the voltage applied across the load should not have affected the current through the load due to the negative feedback. What I would suggest is that try power a single MOSFET and current limit your DUT power supply and see if the same problem arise and if it does. BTW, I have since built a few more active loads and you can check my later articles as well. my battery is 48v and i need to consume 400w, pls how do i do about it pls ? Yes, the reason is that LM324 is unfortunately not rail-to-rail. And the actual offset varies considerably depending on the manufacturers and batches. 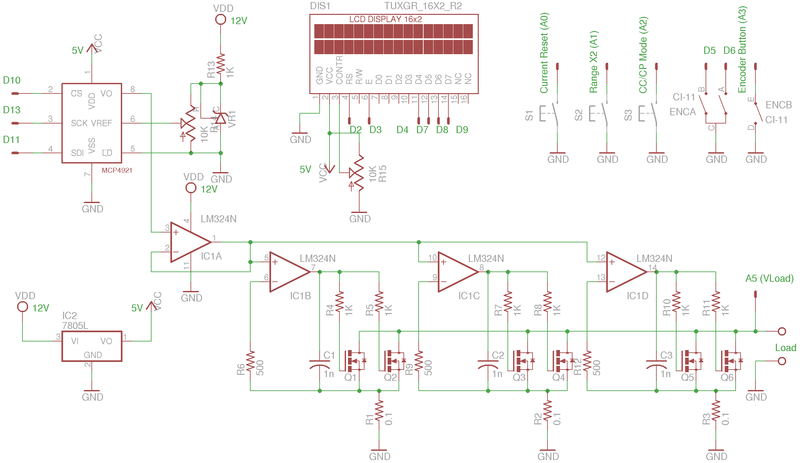 To make the load go all the way down to 0mA when the input is 0, you can either remove the buffer (IC1A) or use a rail-to-rail op-amp such as LT1369. The issue with LMV324 is that the maximum supply voltage is only 5V. If you look at the MOSFET’s Id to Vgs curve you will see that at 5V gate voltage the MOSFET you are using (IXTK62N25) is barely conductive so you will need an Opamp that can operate at least beyond 7V. Hi, very interesting circuit, thanks. I have one observation to make. From my experience, TL431 is a cheap but very unstable shunt regulator. It has a narrow stability zone due to capacitance on its output. You might want to replace it with a cheap voltage reference like LM385Z or LT1009 both which are easy to find. I say this because some might get instability from the TL431 and think that the problem is with the phase margin of the op-amp, thus trying to fix the wrong part of the circuit. Thanks and keep up the good work! Hi, I’ve built this electronic load same as in schematics, but I’m having some problems. Everything works ok, but If I increase the voltage to 30 volts and apply a current of about 6 amps, one mosfet is blown from gate to drain. Also, the same thing happens on 60 volts and 0.5Amp. Also, I noticed that there are some additional resistors from gate to – on your pictures, which I cant find in schematics. What kind of MOSFETs are you using? You could try testing using just a single MOSFET to see the performance and this will give you an idea what to expect with multiples in parallel. When you parallel two together with a shared current sensing resistor you will have some dependencies between the two MOSFETs so you should expect less than twice the dissipated power. Alternatively, you could put a dedicated current sensing resistor on each MOSFET for the best current sharing. Hi, thanks for superfast response. I bought irfp150n’s from eBay, but from more extensive testing, I concluded that they were fakes…. I tried with couple irfp250n’s I have at home and they are working nice. Can I use those, or can I maybe use irfp 460’s (280W)instead? Yes, you can pretty much use any quality MOSFETs you have on hand. Hi Kerry, cool circuit! Could you speak at all about the choice of R1, R6, C1 etc. for ensuring stable performance? Or perhaps if you have know of any resources on how best to choose values? Looks great. I have tried and working. I want to Implement Constant Resistance [CR] and Constant Voltage [CV] mode in Eload. I have tried using program , But it is not working as expected. Is there anything I can add in Hardware or Program level to improve Accuracy ? Any comments are appreciated. could i ask you something? What IDE version (1.0.5) use to compile the firmware? Also I am trying this on an arduino uno, I keep getting a warning about this line of code ” for ( int i = 0 ; i < 4; i++)" and also another like it. I removed the int and declared int i; before void setup and the warnings went away but now it just prints a 0 at the bottom left, before it was showing flickering blocks on the top line, HELP! but like Dave Jones says, "I hope your first electronic project fails so you can learn more" hahaha. thanks for any help. I got the lcd working, it was hanging up on the encoder code, I commented out the block for encoder and then the lcd worked. I then looked back at some previous comments and found that someone was having problems with the new at the time arduino IDE, so I thought maybe the newest version (now) might help, upgraded to 1.8.8 and seems to have fixed it. I will keep you posted. I build this circuit and everything seems to be alright, except that even when cranking the current up to the maximum, I can tell that there’s almost no load going through the MOSFETS (they’re still cold and the battery voltage isn’t going down at all, still at 13v). I probed and I can see that my Vref from the TL431 is adjusted between 0.5v – 0.75v, the output on the DAC is approximately 1.3v, and the gate voltage out of the opamps is approximately 3v. I looked into it and my circuit is built to the same specifications as yours, hopefully without any error. I was wondering if you were getting the MOSFETS to be conductive at 3v? Or is something wrong? I’m using IRFZ44Es. Hi Thomas, If you look at the datasheet, IRFZ44E’s ID versus Vgs curve, you will see that the lowest Vgs shown is 4.5V. So I suspect that the output from the opamp is not high enough to drive the MOSFET. But with a supply voltage of 12V, LM324 should be able to output at least 10V, so not entirely sure why this would be the case. One way to check to ensure that the opamp is in the negative feedback mode is to measure the voltage between the input and negative input and you should get a 0 reading (or very close). Any significant reading would suggest that the circuit is not in the correct mode. Thanks for the insight. After rebuilding the circuit, I’m getting a much higher Vgs now (10.60v to be precise), which seems great… Except now it’s blowing the fuses on my batteries when I plug them in. I’ve tried adjusting the load from 0ma to 9.99a and it’s not changing the Vgs, and it blows fuses no matter what. I’ve made sure that I’ve connected the opamp and DAC the correct way. I even threw my spare LM324N & MCP4921 onto a breadboard with a single pair of MOSFETs to double check the wiring and it’s instantly snap-crackle-pop. Isn’t the feedback from the opamp supposed to allow the gate voltage to increase/decrease linearly? You NEED to download the 1.0.6 IDE. You will not be able to use the DAC or the LCD correctly, unless you re-write code. Also, your current won’t go above 9.99 amps.